From the minute I got my spiralizer , I knew I wanted to make a beet salad. I just love beets. Roasted, raw, juiced or as chips. This salad is not only delicious, it will make you feel amazing! The very first thing I did with the spiralizer was make my Zucchini Pasta with Avocado Pesto. If you are wanting to get more beets into your diet, then this is the recipe to try. The whole thing can be made in a short amount of time. Spiralizing vegetables makes them fun for kids to eat too. 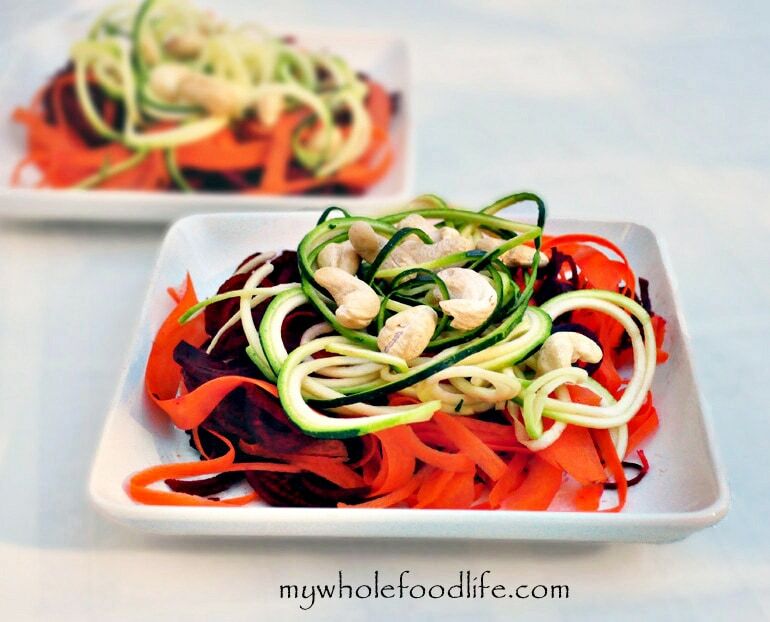 Using a spiralizer , cut the zucchini and beets in long ribbons. I used a peeler to cut the carrots into ribbons. Add all of them to a large bowl. In a small bowl, make the dressing. Pour the dressing onto the salad and mix well. This makes about 3-4 servings. Enjoy! If you need some morre inspiration for your spiralizer , I found a fabulous cook book dedicated to spiralized recipes. You can see it here . Which spiral slicer do you recommend for the veggies? Thanks Tracy! I hope you enjoy this recipe as well! It is time for the spiralizer giveaway including Canadian residents. :) Where did you get yours and how much? I got it on Amazon when it went on sale. I think I payed $23? This is beautiful! And so easy! I love raw cashews. You have a wonderful blog. I am always impressed by your recipes and your dedication. I have been a subscriber for some time, and I am inspired by your work. I love beets and can't wait to try this salad for a quick and easy lunch. I have the Paderno "noodler" and I love it. I hope you enjoy my recipe! I love beets too. I've been meaning to get a spiralizer for about a year now, since around the time I got my dehydrator! Thanks for the reminder with this amazing looking salad! I have to say I never liked beets until I tried them raw - oh my amazing! I love Spa Cuisine! This looks like its bursting with flavor. Thank you for posting. Thanks so much! I love this salad and it's so energizing! Thank you! I just love my spiralizer! Thanks! Yes the beet is raw. You may be able to make this using a peeler. If you try, let me know how it works.